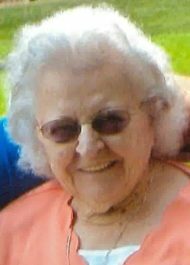 Ethel C. McGarvey, 97, of Lititz, passed away on Monday, March 25, 2019 at Brethren Village Retirement Community. Born in Lancaster, PA, she was the daughter of the late Annie (Mowrer) and Ira Clark. She was the loving wife of the late Paul McGarvey, with whom she shared 71 years of marriage. Ethel worked for Nitrauer Elementary School in Manheim Township for over 25 years. In her free time Ethel enjoyed working in her flower garden, watching game shows and watching the Phillies. She enjoyed traveling and her family vacations at the lake. Most of all, Ethel cherished spending time with her family. Ethel is survived by her daughter Patsy Hinkle of East Petersburg; her granddaughter Lori Bush (Jamie) of Mountville; her great-grandchildren: Landon and Rylee Bush, both of Mountville. Funeral Services will be held at 11AM on Thursday, March 28, 2019 at Charles F. Snyder Funeral Home & Crematory, 3110 Lititz Pike, Lititz PA 17543, with Pastor Mark Thiboldeaux officiating. A viewing will be held from 10AM to 11AM. Burial will be in Trinity Reformed UCC Cemetery. In lieu of flowers, memorial contributions in Ethel’s name may be made to Hospice and Community Care, 685 Good Drive, Box 4125, Lancaster, PA 17604. The family would like to thank the staff at Brethren Village Harvest Way South and the Pink Team at Hospice and Community Care for their care and support. This is your neighbor Barbara Groff, have pleasant memories of visiting wtih your parents on Roseville Road. My sincere condoloences, Barbara Groff.